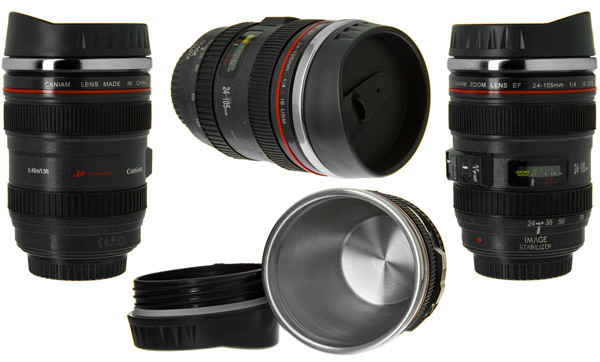 Camera Lens Mug: 12-ounce stainless steel coffee mug looks like a DSLR lens. The Camera Lens Mug can hold up to 12 ounces (355 mL) of your favorite brew and the water-tight twist-off lid features a thumb slider to prevent spills. Dishwasher safe, but hand washing recommended to preserve colorful detailing. 0:39 - The screw-off lid no longer features the "Caniam" logo. The 12-ounce Camera Lens Mug is styled after iconic Canon zoom lenses. 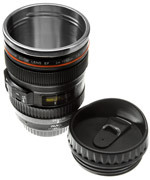 The Camera Lens Mug features a stainless steel inside and a water-tight screw-on lid. The screw-on lid features a rubber o-ring to create a water-tight seal between it and the mug. The lid also features a standard-issue thumb slider to prevent big spills should you knock over your mug. 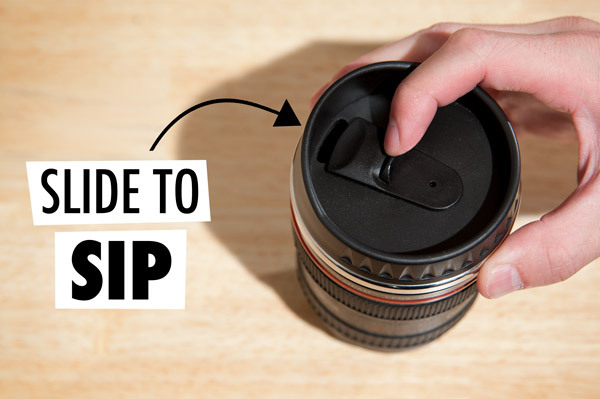 The sip slider and screw-on lid prevent spills. 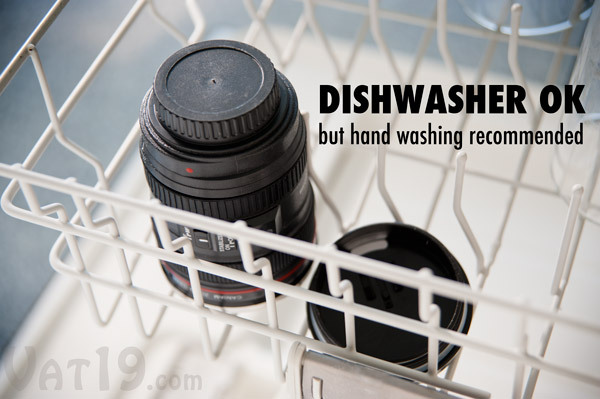 Similar to our Caped Pint Glasses, the Camera Lens Mug is safe for the dishwasher, but the manufacturer recommends hand washing. Some of the colorful detailing may fade when exposed to the high temperatures and heat of a dishwasher. The Camera Lens Mug is safe for use in the dishwasher. However, the manufacturer recommends hand washing to preserve the detailing.